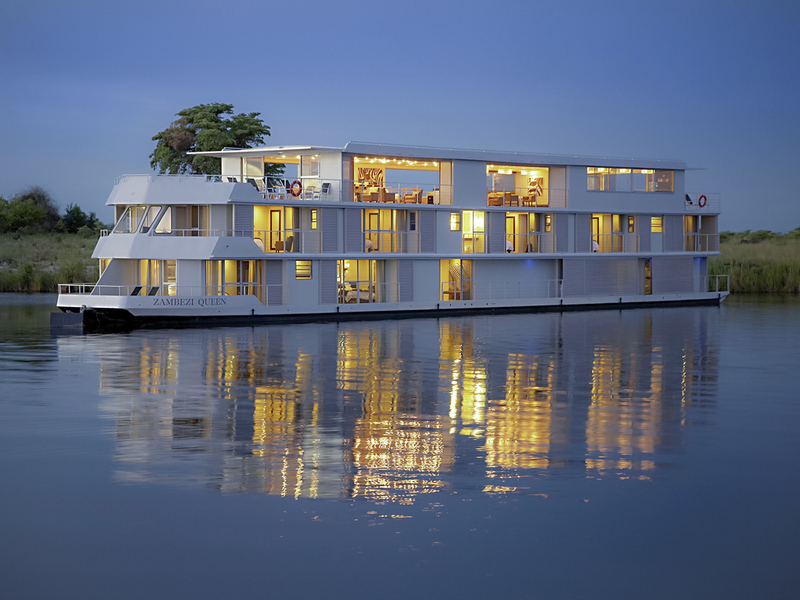 Moving along the banks of the great Chobe River, Zambezi Queen is a 5-star, 42 m long luxury houseboat offering unparalleled sophistication in one of the most remote locations on the planet. Best of all, as a guest on the vessel, you can enjoy a truly unique and adventurous river safari holiday while still being surrounded by complete comfort and elegance. As the Zambezi Queen is located in Namibia, please ensure you familarise yourself with visa requirements applicable to Botswana and Namibia. Zambezi Queen offers luxury houseboat accommodation in the form of 14 tasteful and luxurious suites - ten standard suites and four master suites, all with outer decks so you can soak up the revitalising Chobe River breeze and appreciate uninterrupted views of the unique African landscape beyond. The Zambezi Queen bar provides the perfect location to sip your drinks while watching game on the banks of the Chobe River. All soft drinks, mineral water, coffee, tea, and local beer & wine are included throughout your stay.